The diversity and distribution of benthic amphipods has been explored in the Alacranes Reef, which is the largest coral reef ecosystem in the Gulf of Mexico. New insights into species richness, spatial distribution and extension of geographical ranges are presented by using data from published records and field surveys. A total of 117 species have been recorded, 9 of which are potentially new to science, 39 of which have new geographical records, and 7 are non-indigenous and previously reported in the literature as potentially invasive. Based on the use of a species-richness indicator (Chao 2), the expected species number is 40% higher, up to 200 spp., when compared to the observed species richness. 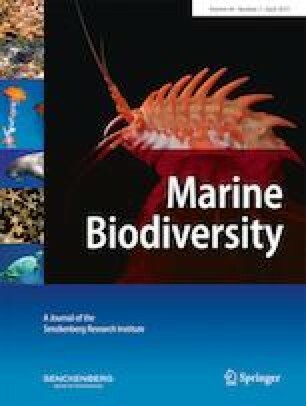 The spatial distribution of amphipods varied significantly as a function of habitat type, showing the highest richness values on coral patches and the major abundances on man-made structures, such as navigation buoys and fishing traps. Multivariate analyses suggested the distinction between three taxonomically diverse species assemblages that showed similar ecological affinities, i.e. those on: (1) soft-bottom environments, grouping bare substrata and seagrass beds habitats; (2) hard-bottom environments, grouping coral patch and reef wall habitats; and (3) artificial substrata. The results highlight the importance of this reef ecosystem for a high amphipod diversity, but it is susceptible to future modifications in the presence of non-indigenous species, potentially invasive, on artificial substrata. The online version of this article ( https://doi.org/10.1007/s12526-017-0843-8) contains supplementary material, which is available to authorized users. Thanks to Alfredo Gallardo, Fernando Mex (UNAM, Sisal) and the other expedition fellows for their help in the 2009 field work. A special thanks to the Oceanography Research Station of the Mexican Navy for the transportation and logistics assistance in Alacranes Reef. Diana Ugalde and Julio Duarte (UNAM, Sisal) helped with the thematic map. CONACYT provided a scholarship to C.P. We also thank two anonymous reviewers for their help in improving a previous version of the manuscript. The sampling permit number issued by the Mexican government (SAGARPA) was DGOPA/055592/120608.1481.